Looking for pet friendly apartments in Waukegan, IL? Look no further than Northgate Apartments! 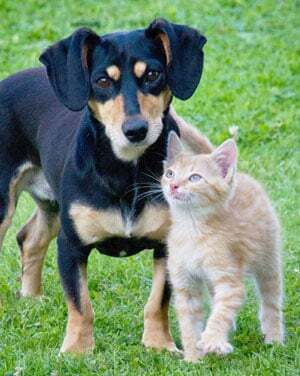 As one of the few pet friendly communities, we proudly allow cats and dogs here at Northgate Apartments. Now your pet has the opportunity to relax by your side and enjoy the comforts of your apartment home. Please contact us for breed and size restrictions and charges. **All pets have to be authorized by management prior to occupancy. Small to larger dogs accepted but weight limits and breed restrictions apply. Call for complete details. My husband and I relocated from another duty station and in the process the staff was so helpful to us and made our transition so smooth. The setup of the apartment buildings are very safe. Very great community. Anytime there is a problem the staff is right on it. They are all very friendly and welcoming. We love these apartments!!! My most favorite apartment feature is laundry on the same floor. My knee says thank you! Also, we have more actual living space than in our old house. The staff is great also. We had a few issues and they were handled quickly. I have been living here for a year now and my favorite part about living here is the convenience of the location of Northgate. For me personally it is close to work but I also like the fact that there are tons of restaurants, grocery stores and shops close by within the community. My favorite feature in my apartment is definitely the dishwasher! I would say my favorite amenity offered is the gym. I've enjoyed my time here so far! I love living at Northgate Apartments. It is conveniently located, accessible to important community features and a nice place to live! After two years of living here, and just signing my next-year lease, I am proud to call Northgate my home. The staff are awesome people and very receptive to the needs of the tenants; they live here too! By and far Northgate is the best choice in the area. I looked everywhere on my initial search and am happy I found this gem!!! I am going on two years living at Northgate Apartments. I enjoy all the features in my apartments, specially the convenience of having a washer and dryer inside my apartment. I love the pool, which is always very clean and well maintained. Northgate Apartments is an outstanding community, the safeness along with all their amenities is what sets it apart from other communities in town. Outstanding job! This remark is coming from a resident that has lived with his wife at Northgate for the past 8 years. You are very kind and understanding, your maintenance staff is GREAT. Keep up the good work. Once again Northgate under Aimee has exceeded expectations! Thank you !I'm in (and remain in) your debt. Nicky arrived promptly, analyzed my need and returned w/everything needed to fix! He was clean, left the place spotless and was a joy. Great job Aimee, great staff thanks to you and to Nicky. If you would, please do convey my thanks directly to Nicky, he really performed. Thank you so very much! The work order has been completed. I truly appreciate the communication and making sure we are satisfied tenants! We just wanted to say Thank You! for the quick and courteous response to all of our maintenance requests. The gentlemen are respectful of the ladies and do a good job. We greatly appreciate this effort. It makes living here easy.